Today is the last day of the YNS blog hop, so make sure you leave a comment on all the Starlets blogs to be eligible for the $50.00 prize, the secret $20.00 prize and the individual prizes on all the Starlets blogs!!! Thank you so much for stopping by! Wow! This card is like magic, little fairy-tale! It really is perfect for a little princess! Love this card, Kerri! Love the cupackes at the top and very beautiful colors! Thank you for brightening my day! Such a cute card Kerri! Love your interpretation of the sketch and all the colors! This is so pretty....your coloring is fantastic. Love the rich darker colors in the dresses instead of light pastels like you would think. I have that same DCWV matstack and I don't like using cheap-o paper, but sometimes they have really cute things in them that look fantastic on something like you did here! What a perfect Princess birthday card Kerri! I can understand why it's one of your fave images...it's adorable, and you did an ab/fab job hun coloring it in as well. 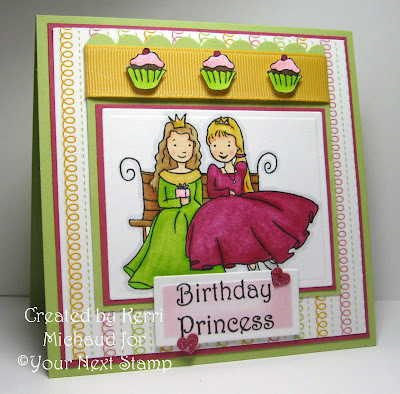 Love the sponging of color on your sentiment too! I love the colors you have chosen and your coloring is fabulous! Those cupcakes look awesome along the top! I love it!!! So so cute! These girls are darling and great colors. This is so sweet Kerri!! I just love those adorable images and your coloring is spectacular!! Great colors and design! !